Also known as the Hispaniolan solenodon, this creature is found on the island of Hispaniola in Haiti and the Dominican Republic. It is very similar in appearance to the shrew, but much larger, reaching from 11 to 13 inches in length, and weighing between 1-2 lbs. The tail is an additional 9.8 inches long. The fur is brownish-red, long, and coarse, and there is no fur on its tail, legs, ear tips, and snout. All of its legs are equipped with strong claws for digging. Its head is very big in relation to its body, and its ears and eyes are very tiny, partially hidden by fur. This creature is known for its slow and clumsy way of running or walking, especially when trying to escape predators. It appears to have difficulty running in a straight line and tends to trip over its own toes or tumbling onto its back. This creature prefers woody and rocky areas for its habitat, and it is often found near areas of agriculturally developed land. Solenodons prefer to be active at night, and during the day they find shelter in tunnel systems that they build. The tunnel systems are very complex and built using organic material and soil. 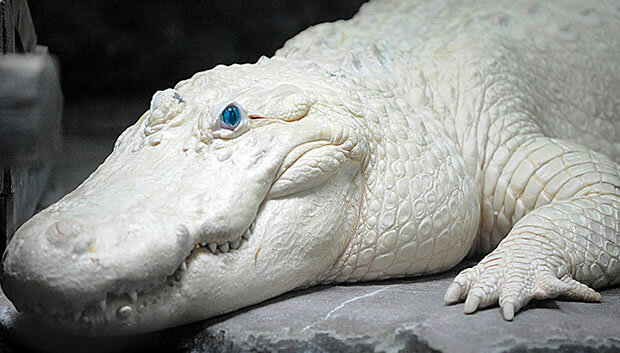 They may also hide and rest in logs, trees, and crocks. It is not fully known what this creature eats; some believe this creature eats fruits and plants, and other believe that it only eats invertebrates such as earthworms, ground beetles, millipedes, and snails, and no form of fruit or plant. 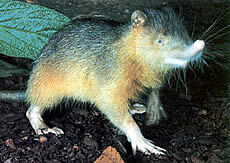 The solenodon possesses poisonous salivary glands which inject venom into its prey as it is bitten, making it one of the very few and rare poisonous mammals. Little is known about its reproductive behavior, but females are known to build nests before giving birth to two young. In the last two decades, this creature has become critically endangered due to the introduction of new predators into its range, including domesticated dogs and cats. This species is also threatened by loss of habitat due to deforestation and human disturbance. All remaining populations are said to be found only in two places in the Dominican Republic: Jaragua and Del Este National Parks and La Visite National Park in Haiti. Copyright Notice: This article is licensed under the GNU Free Documentation License. It uses material from the Wikipedia article "Hispaniolan solenodon". Glenn, C. R. 2006. "Earth's Endangered Creatures - Haitian Solenodon Facts" (Online). Accessed 4/19/2019 at http://earthsendangered.com/profile.asp?sp=429&ID=5. Need more Haitian Solenodon facts?